MelTed Self Care for your Soul and Instagram Yoga! MELTed Self Care for your Soul! The inner thigh can be loaded with Stuck Stress so be mindful NOT to cause pain. It’s sensitive for all of us, but PAIN is your body telling you you are going too deep too fast! Day 16 of #nourishwithyoga is a strengthening pose and I give you #Bakasana –#CrowPose. Today I’m simply inspired by the beautiful work of balancing our own energy! May you find peace and balance throughout your life! Namaste. Love and Light! Day 5 of #blossomintoasanas is #Deviasana–#goddesspose for Svadhisthana/Sacral – Second Chakra which holds our connection to our emotions, desire, creativity, and sexuality. When in balance one feels abundance, wellness, pleasure, and joy. When out of balance one can experience emotional instability, fear of change, sexual dysfunction, depression, and addictions. This is actually my first time EVER doing this pose, and I must say it feels beautiful! 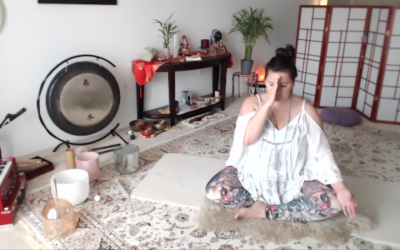 I felt grounded, open and receptive through my hips, and blissfully my attention naturally went within to the power of divine feminine energy. Svadhisthana Affirmation . . .